Mutations in genes that constitute the phosphatidylinositol 3-kinase (PI3K) pathway occur in >70% of breast cancers. Clinical and experimental evidence suggest that PI3K pathway activation promotes resistance to some of the current breast cancer therapies. PI3K is a major signaling hub downstream of human epidermal growth factor receptor (HER)2 and other receptor tyrosine kinases. PI3K activates AKT, serum/glucocorticoid regulated kinase (SGK), phosphoinositide-dependent kinase 1 (PDK1), mammalian target of rapamycin (mTOR), and several other molecules involved in cell cycle progression and survival. In estrogen receptor (ER)+ breast cancer cells, PI3K activation promotes estrogen-dependent and -independent ER transcriptional activity, which, in turn, may contribute to anti-estrogen resistance. Activation of this pathway also confers resistance to HER2-targeted therapies. In experimental models of resistance to anti-estrogens and HER2 inhibitors, pharmacological inhibition of PI3K/AKT/mTOR has been shown to overcome drug resistance. Early clinical data suggest that combined inhibition of either HER2 or ER plus inhibition of the PI3K pathway might be an effective strategy for treatment of respective HER2+ and ER+ breast cancers resistant to standard therapies. Here, we review alterations in the PI3K pathway in breast cancer, their association with therapeutic resistance, and the state of clinical development of PI3K pathway inhibitors. The phosphatidylinositol 3-kinase (PI3K) pathway is the most frequently mutated pathway in breast cancer, with mutation and/or amplification of the genes encoding the PI3K catalytic subunits p110α (PIK3CA) and p110β (PIK3CB), the PI3K regulatory subunit p85α (PIK3R1), receptor tyrosine kinases (RTKs) such as human epidermal growth factor receptor (HER)2 (ERBB2) and fibroblast growth factor receptor (FGFR)1, the PI3K activator K-Ras, the PI3K effectors AKT1, AKT2, and phosphoinositide-dependent kinase 1 (PDK1), and loss of the lipid phosphatases PTEN (phosphatase and tensin homolog) and INPP4B (inositol polyphosphate-4-phosphatase, type II) (Table 1). PI3K is activated by growth factor RTKs and G-protein-coupled receptors (Figure 1). PI3K phosphorylates phosphatidylinositol 4,5-bisphosphate (PIP2) to produce phosphatidylinositol 3,4,5-trisphosphate (PIP3). In turn, PIP3 recruits to the plasma membrane several pleckstrin homology (PH) domain-containing proteins, such as PDK1 and AKT, which, upon activation, drive cell cycle progression and survival. Negative regulation of this pathway is conferred by PTEN and INPP4B, which dephosphorylate PIP3 and PIP2, respectively. Akt phosphorylates and inactivates Tuberin (TSC2), a GTPase-activating protein of the Ras homologue Rheb. Inactivation of Tuberin allows GTP bound-Rheb to accumulate and activate the mammalian target of rapamycin (mTOR)/Raptor (TORC1) complex, which ultimately regulates protein synthesis and cell growth . mTOR also couples with Rictor to form the TORC2 complex, which phosphorylates and activates AKT at Ser473. EGFR, epidermal growth factor receptor; ER, estrogen receptor; FGFR, fibroblast growth factor receptor; HER, human epidermal growth factor receptor; IGF-1R, insulin-like growth factor-1 receptor; INPP4B, inositol polyphosphate-4-phosphatase, type II; InsR, insulin receptor; MEK, mitogen-activated protein kinase kinase; PDK1, phosphoinositide-dependent kinase 1; PI3K, phosphatidylinositol 3-kinase; TN, triple negative. Diagram of the phosphatidylinositol 3-kinase signaling pathway. Tumor promoters and suppressors are labeled in pink and blue, respectively. Nodes targeted by drugs in clinical development are shown in red. AMPK, AMP-activated protein kinase; GPCR, G-protein-coupled receptor; GSK3, glycogen synthase kinase 3; INPP4B, inositol polyphosphate-4-phosphatase, type II; LKB1, liver kinase B1; PDK1, phosphoinositide-dependent kinase 1; PI3K, phosphatidylinositol 3-kinase; PIP1, phosphatidylinositol monophosphate; PIP2, phosphatidylinositol 4,5-bisphosphate; PIP3, phosphatidylinositol 3,4,5-trisphosphate; PTEN, phosphatase and tensin homolog; RTK, receptor tyrosine kinase. Class IA PI3K isoforms are heterodimeric lipid kinases that contain a p110 catalytic subunit and a p85 regulatory subunit. The three genes PIK3CA, PIK3CB, and PIK3CD encode the homologous p110α, p110β, and p110δ isozymes, respectively. Expression of p110δ is largely restricted to immune and hematopoietic cells, whereas p110α and p110β are ubiquitously expressed. PIK3CA mutations are the most common genetic alterations of this pathway in breast cancer, where ≥80% occur within the helical (E542K and E545K) and kinase (H1047R) domains of p110α. Such mutations confer increased catalytic activity through different mechanisms , but both induce characteristics of cellular transformation, including growth factor- and anchorage-independent growth, and resistance to anoikis . Temporally regulated expression of the H1047R mutant in the mammary gland of transgenic mice induces mammary tumor formation . Genetic or pharmacological inactivation of PIK3CA H1047R expression results in disappearance of mammary tumors. However, some of these recur and become insensitive to PI3K inhibition via c-myc overexpression . PI3K pathway alterations frequently co-occur in breast cancer, suggesting that they confer advantages to cancer cells by different mechanisms. For example, PIK3CA mutations sometimes occur in breast tumors harboring PTEN loss or HER2 overexpression [6–8]. p110α is essential for signaling and growth of tumors driven by PIK3CA mutations, RTKs, and/or mutant Ras, whereas p110β lies downstream of G-protein-coupled receptors and has been shown to mediate tumorigenesis in PTEN-deficient cells . HER2 overexpression and PIK3CA mutations are commonly found in both ductal carcinoma in situ and invasive breast cancers. However, PIK3CA mutations are found at a lower frequency in intraepithelial neoplastic lesions. This suggests that PIK3CA mutations can further augment PI3K pathway activation mediated by other oncogenes such as ERBB2 (HER2) [10–14]. Molecular analyses have shown that breast cancer is a collection of diseases that generally fit into three subtypes that respond to different therapeutics and exhibit a different natural history. Breast cancers that express estrogen receptor α (ER) and/or progesterone receptor (PR) are hormone-dependent and, as such, respond to therapies that inhibit ER signaling by multiple mechanisms. HER2-positive cancers exhibit amplification or overexpression of the ERBB2 (HER2) proto-oncogene and respond clinically when treated with HER2-directed therapies. Triple-negative breast cancers (TNBCs), which lack detectable expression of ER, PR, and HER2, have no approved targeted therapy and are treated with traditional chemotherapy. Therefore, we will separately review the roles of molecular alterations in the PI3K pathway in each breast cancer subtype and their clinical implications. Several drugs targeting multiple levels of the PI3K network (that is, PI3K, AKT, mTOR) are in clinical development in breast cancer. The first group encompasses ATP mimetics that bind competitively and reversibly to the ATP-binding pocket of p110; some of these compounds also bind and inhibit mTOR (Table 2). Notably, the pan-PI3K and p110α-specific inhibitors are equally potent against oncogenic mutants of p110α [15, 16]. A second group includes allosteric and ATP-competitive inhibitors of the three isoforms of AKT; these have also shown antitumor activity in preclinical models [17–19] and recently entered human trials. Allo-steric inhibitors such as MK-2206 bind to the PH domain and/or hinge region in AKT to promote an inactive conformation and thus prevent localization (and activation) of AKT to the plasma membrane . The macrolide rapamycin and its analogs (rapalogs) complex with FK506-binding protein (FKBP12), which then binds to mTOR and inhibits the kinase activity of TORC1 but not TORC2 . Formulation problems with rapamycin and its inability to effectively inhibit phosphorylation of 4E-BP proteins (which are TORC1 substrates that promote translation) prompted the development of analogs that have shown cytostatic activity in preclinical models and clinical trials . Compounds that target the ATP-binding cleft of mTOR, and are thus active against both TORC1 and TORC2 , are also in phase I trials. mTOR, mammalian target of rapamycin; PI3K, phosphatidylinositol 3-kinase. Inhibition of TORC1 relieves negative feedback on activators of PI3K (for example, insulin-like growth factor-1 receptor (IGF-1R), insulin receptor substrate 1 (IRS-1), HER3) [22–24], suggesting that direct inhibitors of PI3K may be more effective. However, inhibition of PI3K or AKT also results in feedback upregulation/activation of several RTKs, which, by providing an input to PI3K, may counteract drug action and/or activate other oncogenic pathways such as the mitogen-activated protein kinase kinase (MEK) pathway [17, 25–27]. These data suggest that PI3K/AKT/TORC1 inhibitors could be combined with RTK inhibitors to induce an optimal antitumor effect. Consistent with this notion, studies in human cancer xenografts have shown that combinations of inhibitors targeting HER2 and PI3K, HER2 and AKT, HER2 and TORC1, or epidermal growth factor receptor (EGFR) and AKT are superior to single-agent treatments [17, 22, 25, 26]. Approximately 75% of primary breast cancers express ER and/or PR. Such hormone receptor expression typically indicates a degree of estrogen dependence for cancer cell growth. Treatments for these patients inhibit ER function either by antagonizing ligand binding to ER (tamoxifen and other selective estrogen receptor modulators (SERMs)), downregulating ER (fulvestrant), or blocking estrogen biosynthesis (aromatase inhibitors (AIs)). Although endocrine therapies have changed the natural history of hormone-dependent breast cancer, >30% of patients with early ER+ breast cancer relapse within 15 years following adjuvant therapy with tamoxifen, and approximately 20% of patients treated with an AI relapse within 9 years [28, 29]. A mechanism of resistance to endocrine therapy involves overexpression of HER2 [30–32]. However, <10% of ER+ breast cancers express high HER2 levels, suggesting that for the majority of ER+ breast cancers, mechanisms of escape from endocrine therapy remain to be elucidated. In addition to its pro-survival and growth-promoting roles, the PI3K pathway interacts with ER directly  and indirectly. ER phosphorylation at Ser167 by AKT or p70S6K increases estrogen-induced, tamoxifen-induced, and ligand-independent ER transcriptional activity [33, 34]. Additionally, PI3K and Ras contribute to the modulation of ER and transcription cofactors [35–45]. The activation of ER by growth factor RTK signaling is reciprocated in a feed-forward fashion, whereby ER promotes the transcription of genes encoding receptor ligands, RTKs, and signaling adaptors [45–50]. Clinical evidence further suggests that ER may activate the PI3K pathway. For example, neoadjuvant treatment of patients bearing ER+ breast cancer with the AI letrozole reduces P-AKTS473, P-mTORS2448, and P-S6 tumor levels; these reductions have been shown to correlate with clinical response [51, 52]. Emerging evidence also implicates estrogens in the rapid, non-genomic activation of PI3K via IGF-1R/insulin receptor (InsR), EGFR, Src, PI3K, and MEK [53–56]. PI3K pathway activation has been shown to confer anti-estrogen resistance in various experimental models, including in PTEN-deficient cells, and in cells overexpressing HER2, IGF-1R, or an activated mutant of AKT1 [33, 44, 54]. Tumor cells with acquired endocrine resistance have shown upregulation of IGF-1R, InsR, HER2, and EGFR levels as well as PI3K/AKT/mTOR activation [57–61]. Inhibition of the PI3K pathway reverses such anti-estrogen resistance. However, PI3K or AKT inhibition relieves feedback inhibition of the expression and activation of RTKs, which can contribute to drug resistance [17, 25, 26]. Interestingly, a recent study showed that in ER+ breast cancer cells treated with the PI3K/mTOR inhibitor BEZ235 or with PI3K siRNA, exogenous estradiol prevented drug- and siRNA-induced apoptosis . Since most breast cancers that adapt to anti-estrogen therapy retain ER, these data imply that unopposed estrogen ligands may protect ER+ tumors from the therapeutic effects of PI3K inhibitors used as single agents. Clinical evidence suggests that activation of PI3K via overexpression of HER2 or FGFR1, or loss of INPP4B also confers anti-estrogen resistance to patients with ER+ breast cancer [30–32, 63, 64]. Whether other mutations in the PI3K pathway correlate with anti-estrogen resistance remains to be determined. PIK3CA mutations occur in 28 to 47% of ER+ breast cancers. Interestingly, such mutations correlate with good long-term outcome and lower PI3K and TORC1 activation as assessed by gene expression profiling and immunohistochemistry (IHC) in patients bearing ER+ tumors [6, 52, 65–68]. Despite these findings, preclinical evidence indicates that combined targeting of PI3K and ER is synergistic , suggesting that combinations of anti-estrogens and PI3K pathway inhibitors will be clinically more effective than anti-estrogens alone. The correlations between PIK3CA mutations, good patient outcome, and low PI3K pathway activation (measured by gene expression profiling and IHC) beg the need for alternative methods indicative of PI3K pathway activation to identify ER+ tumors at risk of recurrence. For example, a primary breast tumor gene expression signature of PTEN loss, derived from a comparison of PTEN-expressing versus PTEN-negative tumors by IHC, was predictive of poor relapse-free survival following tamoxifen, while PTEN status by IHC was not . Breast cancers of the luminal A and luminal B molecular subtypes (based on gene expression profiling) are typically ER+. However, luminal B tumors benefit less from adjuvant anti-estrogen therapy . Of note, a gene expression signature of PI3K activation, based on tumor levels of a panel of phosphoproteins (for example, P-AKT, P-p70S6K) in ER+ tumors, was enriched in luminal B breast cancers . This suggests that luminal B tumors have higher PI3K activity, which may contribute to their lower response to anti-estrogens compared to luminal A tumors . Similarly, we identified a tumor protein signature of PI3K pathway activation that predicts poor outcome following adjuvant endocrine therapy . Therefore, signatures of PI3K activation may complement mutational analyses for the identification of high-risk, PI3K-driven, ER+ tumors. Further rationale for combined inhibition of PI3K and ER comes from studies using inhibitors of TORC1 or HER2. In patients with ER+ tumors randomized to neoadjuvant letrozole with or without the TORC1 inhibitor everolimus for 4 months before surgery, the addition of everolimus increased clinical response and suppression of tumor cell proliferation . In the TAMRAD study in patients with metastatic ER+ breast cancer who had progressed on an AI, the addition of everolimus to tamoxifen improved the rate of clinical benefit, time-to-progression, and disease-free survival compared to women receiving tamoxifen alone . Most recently, results from the phase III trial BOLERO-2 showed that treatment with everolimus plus the AI exemestane provided a time-to-progression of 10.6 months compared to 4.1 months with the AI alone in post-menopausal women with advanced breast cancer who had recurred or progressed on prior endocrine therapy . The ER and PI3K pathways appear to exist in an equilibrium, where tumors with low PI3K activation have high ER levels, and vice versa [58, 71]. 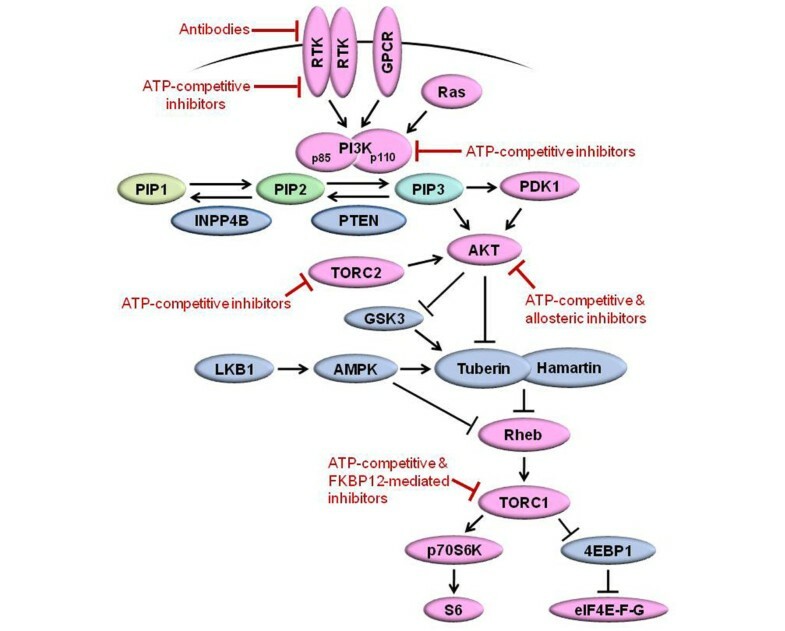 The inter-dependence of these pathways is supported by studies showing that inhibition of HER2 with the antibody trastuzumab or the tyrosine kinase inhibitor lapatinib restores or upregulates ER levels or transcriptional activity in breast cancer cells and patient tumors. Furthermore, treatment with AIs or fulvestrant inhibits the growth of HER2+ tumors that had progressed on trastuzumab or lapatinib [75, 76]. These data suggest that combined inhibition of ER and HER2, an RTK that potently activates PI3K, may provide more effective control of ER+/HER2+ tumors. Indeed, two clinical trials showed that the addition of trastuzumab or lapatinib to therapy with an AI increased progression-free survival and clinical benefit compared to the AI alone [77, 78]. Most patients bearing breast cancers with amplification or overexpression of HER2 benefit from anti-HER2 therapy. However, most patients with HER2+ metastatic disease eventually acquire resistance to trastuzumab, lapatinib, and the combination [79–81]. HER2 potently activates PI3K via heterodimerization with HER3, and other PI3K pathway activating mutations often coexist in HER2+ cancers (Table 1). Experimental and clinical evidence suggest that mutational activation of the PI3K pathway confers resistance to HER2-directed therapies, perhaps by providing an additional input to this pathway independent of HER2/HER3 dimers. 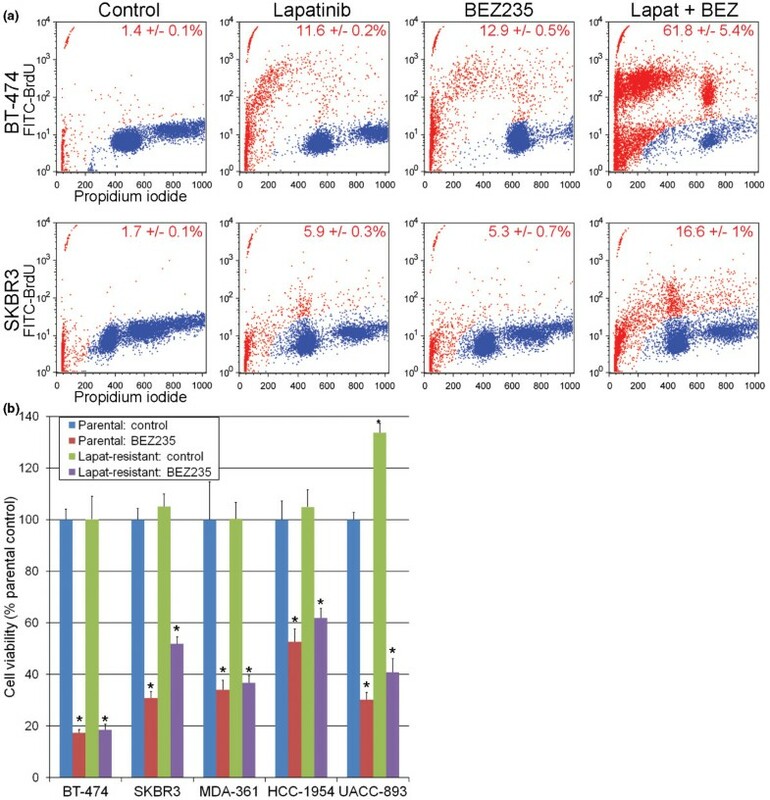 HER2+ breast cancer cell lines are highly sensitive to PI3K and mTOR inhibitors before and after acquiring resistance to trastuzumab or lapatinib [22, 82, 83] (Figure 2). These data suggest that these drug-resistant cells remain PI3K-dependent, and that patients with trastuzumab- and/or lapatinib-resistant disease would benefit from PI3K pathway inhibitors. Inhibition of phosphatidylinositol 3-kinase/mammalian target of rapamycin abrogates lapatinib resistance in HER2+ breast cancer cells. (a) BT-474 and SKBR3 cells were serum-starved for 3 days, then treated with or without 1 μM lapatinib or 250 nM BEZ235 for 2 days. Cells were fixed, stained using the ApoBrdU kit (Phoenix Flow Systems), and analyzed by flow cytometry. Cells were considered apoptotic if they exhibited sub-G1 levels by propidium iodide staining, and/or high fluorescein isothiocyanate (FITC)-bromodeoxyuridine (BrdU) labeling. Representative plots are shown, and the percentage of apoptotic cells (mean of triplicates ± standard deviation) is noted in each panel; blue, live; red, dead. (b) BT474 and SKBR3 cells were selected for long-term growth in the presence of 2 μM lapatinib to generate resistant cells . Parental and lapatinib-resistant cells were treated with or without 250 nM BEZ235 in growth medium (lapatinib-resistant cells were maintained in 2 μM lapatinib). Media and drugs were replenished every 2 to 3 days. Cell viability was measured after 5 to 6 days by WST1 assay (Roche). Data are presented as percentage parental control for each cell line, mean of triplicates ± standard deviation. *P < 0.05 by Bonferroni post-hoc test compared to parental control. Retrospective analyses of cohorts of patients with HER2+ metastatic breast cancer have shown that tumors harboring PIK3CA mutations and/or decreased levels of PTEN have a poor outcome following treatment with trastuzumab compared to HER2+ tumors with a 'wild-type' PI3K pathway [84–87]. In addition, a neoadjuvant study in patients with HER2+ breast cancer showed that both alterations (PIK3CA mutations and PTEN loss) were associated with a statistically lower pathological complete response rate to trastuzumab with chemotherapy. However, tumors with decreased PTEN responded to neoadjuvant therapy with lapatinib followed by trastuzumab and chemotherapy . Pending confirmation of this report, these data suggest that PTEN-deficient HER2+ cancer cells still rely heavily on upstream input from HER2 and, therefore, dual blockade of HER2 with trastuzumab and lapatinib is effective against HER2+/PTEN-deficient breast cancers. A few studies suggest that combined targeting of HER2 and the PI3K pathway is superior to HER2-directed therapy alone. In patients who had progressed on trastuzumab and chemotherapy, the addition of the TORC1 inhibitor everolimus to trastuzumab and chemotherapy conferred a 19 to 44% objective response rate [89–91]. Preclinical studies also suggest that because of the reactivation of HER3 following inhibition of PI3K/AKT/TORC1 in HER2-overexpressing breast cancer cells, PI3K inhibitors should be given in combination with anti-HER2 therapy in patients with HER2 tumors [22, 25, 92]. At this time, patients with drug-resistant HER2+ breast cancer are a subgroup of intense focus in exploratory trials with PI3K pathway inhibitors. Since ER, PR, and HER2 are established molecular markers associated with response to targeted therapies, ER-/PR-/HER2-negative cancers are loosely grouped as TNBCs. Such cancers occur in 10 to 15% of patients, are associated with earlier age at diagnosis, poor prognosis, and BRCA1 mutations, and are more prevalent in African-American and Hispanic women . By gene expression profiling, TNBCs cluster separately from ER+ and HER2+ cancers, mainly within the basal-like molecular subtype. A recent analysis revealed that TNBCs can be divided into six subtypes . Interestingly, the 'mesenchymal-like' and 'mesenchymal stem-like' subtypes exhibit enrichment for components of growth factor signaling pathways, including inositol phosphate metabolism. Growth of breast cancer cell lines classified as 'mesenchymal-like,' 'mesenchymal stem-like', or 'luminal androgen receptor subtype' was inhibited by the PI3K/mTOR inhibitor BEZ235. Cell lines of the 'luminal androgen receptor subtype' exhibit a high frequency of PIK3CA mutations. In contrast, PTEN status did not correlate with sensitivity to BEZ235. PTEN has functions outside of the PI3K pathway, including in DNA double-strand break repair. In addition, BRCA1 mutations impair double-strand break repair and correlate with the presence of PTEN mutations , and PTEN knock-down has been shown to sensitize BRCA1-mutant cancer cells to poly(ADP-ribose) polymerase (PARP) inhibition [96, 97]. Thus, it is conceivable that PTEN-deficient cells may respond to combined PI3K/PARP-directed therapy. The standard treatment for patients with TNBC includes mainly DNA-damaging chemotherapy. PI3K pathway mutations have been associated with resistance to such agents, likely by promoting cell survival. Also, DNA damage elicits DNA-dependent protein kinase-mediated phosphorylation of AKT . Preclinical studies in diverse cancer cell types have shown that PI3K inhibitors enhance the apoptotic effects of DNA-damaging agents [99–102]. Clinical trials are ongoing to test such drug combinations in patients with TNBC. Somatic mutations in the PI3K pathway identify cancers with aberrant activation of, and potential dependence on, this signaling pathway. These attributes may be useful for the selection of patients for trials with PI3K inhibitors. Indeed, a recent analysis of patients with solid tumors enrolled in phase I trials with PI3K/AKT/mTOR inhibitors showed a higher response rate among patients with PIK3CA-mutant versus wild-type PIK3CA cancers . This suggests that tumors with gain-of-function mutations in the PI3K pathway depend on PI3K signaling, and this dependence can be exploited in patients with such cancers. There is increasing agreement that initial phase II efficacy studies with PI3K inhibitors in patients with advanced disease should be enriched with, if not limited to, patients harboring mutations and/or activation of this pathway. As with other targeted therapies, only a fraction of patients will likely benefit from single-agent PI3K-directed therapy. PI3K pathway inhibitors are being tested in human trials in combination with inhibitors of HER2, MEK, and ER. Early clinical data suggest that this strategy is feasible and that, as single agents, these drugs are well-tolerated. To determine if inhibition of PI3K confers a benefit compared to standard targeted therapies alone will require randomized clinical trials. This work was supported by the National Institutes of Health K99CA142899 (TWM), K08CA143153 (BNR), Breast Cancer Specialized Program of Research Excellence (SPORE) P50CA98131, Vanderbilt-Ingram Cancer Center Support Grant P30CA68485; a grant from the Breast Cancer Research Foundation (CLA); American Cancer Society Clinical Research Professorship Grant CRP-07-234 (CLA) and Postdoctoral Fellowship 118813-PF-10-070-01-TBG (JTG); the Department of Defense BC093376 (JTG) and BC087465 (BNR); the Lee Jeans Translational Breast Cancer Research Program (CLA); and Stand Up to Cancer/American Association for Cancer Research Dream Team Translational Cancer Research Grant SU2C-AACR-DT0209 (CLA).